TimberTech composite decks are easy to maintain, incredibly durable, and Perry Hall homeowners really appreciate the increased home value. According to Remodeling Magazine’s annual Cost vs. Value report, a composite deck carries an average return on investment (ROI) of 77% here in Perry Hall, Maryland. That is significantly higher than the national average (68%), which is just one of the many reasons homeowners throughout the state choose composite decking time and time again. TimberTech composite decking products are low maintenance, safe, durable, and add beauty and value to any home. Perry Hall is growing community in Baltimore County, Maryland with a population of 28,474, as of the 2010 census. The median home value in Perry Hall is $270,400, with a median sale price of $241,324. Real professionals stress that additions such as patios and composite decks help a home sell faster and for more money. As we said above, a composite deck has an average ROI of 77% in Maryland. That means that when you sell your home you can expect to recoup roughly $0.77 for every $1.00 you spend on your new deck. While it is initially more expensive than wood, a composite deck, like TimberTech, will save homeowners money in the long run because they are low maintenance. Wood has to be sanded and stained every few years. Composite decks, meanwhile, continue to look great and maintain its color with minimal maintenance on your part. That’s what we like to call a win-win! This saves time and money over the life of your deck. A wood deck has an average lifespan of 10-15 years with regular maintenance, while a composite deck can easily last 25 years or more. This is why TimberTech is not afraid to offer a 25-year, transferable warranty, giving homeowners peace of mind knowing their composite deck will look great year after year after year. Freedom Fence and Home is a local composite deck builder that prides itself on delivering a high quality product and experience for a fair price. Our crews are highly trained and have been performing deck construction for years. You can view our gallery to familiarize yourself with our work. Our design consultants will help guide you to make an educational decision that suits your needs, fits your budget and compliments your home. 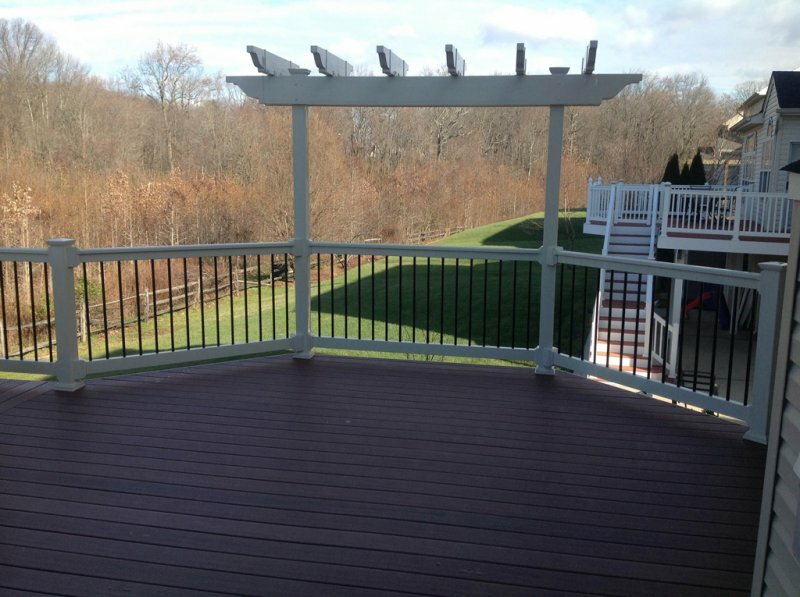 If you have any questions about TimberTech or wish to schedule a composite deck project, please contact Freedom Fence and Home by calling 443-271-6841. As many of our customers can attest our quality and customer service exceeds our competitors. This entry was posted on Monday, September 28th, 2015	at 12:55 pm	. Both comments and pings are currently closed.